There are several printers around campus accessible for all those who have access to the UAS secured network. Most printers are black and white, but the Library offers color printing through the Ink Smart service. All printing is double-sided because of Alaska Statute, Sec 44.99.020, which requires government institutions to print on both sides of the paper. The Helpdesk and Classroom Support staff are available to assist with your questions! In order to access printers on campus, excluding the Library's Ink Smart system, you must have access to the UAS secured network and “authenticate” to the Printer Server (active username and password required). We recommend NOT saving your password. When complete, a window will appear showing all printers available on campus. Double click on a printer to add it to your computer. When adding is complete, you will see the printer queue monitor. ** Note: If you aren’t prompted for login info, check your security settings. Some internet security software blocks this type of connection. In the Protocol field, select an appropriate setting. Many printers require "Line Printer Daemon - LPD"
You may be prompted for additional configuration settings, click continue. You can now print to the new device! If you encounter the error “Unable to Connect. 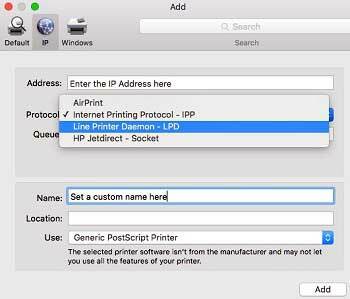 Unable to verify the printer on your network”, set the Protocol to “Line Printer Daemon (LPD)” instead of the default “Internet Printing Protocol (IPP).” This is a known issue with specific printer manufacturers. If you have need of another printer not listed, please contact the Helpdesk for further assistance. Print/Scan/Copy/Fax services are located on the main level (2nd floor) of the Egan Library and lobby. Egan Library offers managed printing (pay-per-print) powered by Ink Labs, Inc. This service enables printing from virtually any device, as well as cloud accounts and USB drives. Users can print from all library computers, personal computers, can connect to documents from cloud storage services at the kiosk or files (attachments) can be sent from the email adddress associated with your Ink account to upload@print.inkcloud.me. Print jobs are only released when the user logs in/swipes their card and pays for the prints at a kiosk. Kiosks are located in the Egan Library and in the lobby. Drivers are available for personal computers using the links below. All online accounts are managed by Ink and the service accepts promo codes, credit cards, and Ink preloaded cards (see below). UAS users can enter the promo code "firsttime" for a $5 credit. Guests can ask for an Ink Guest Card (includes a $2.50 promo credit) at the Circulation Desk. Access your account online to add funds with a credit/debit card or add at a kiosk in the library or lobby. Whale Bucks CANNOT be used for printing. Remaining balances on print accounts (Ink) are not refundable when you graduate or transfer. Be judicious when adding funds to your account. Users without access to an accepted payment method can purchase preloaded Ink cards at the Library Circulation desk in $5 for $10 amounts. Print jobs are only released when the user logs in/swipes their card and pays for the prints at the kiosk. Print jobs remain in the print queue for 72 hours. For personal computers, in addition to using a drag-and-drop interface through the UAS Ink Cloud Portal, you can also load a print driver in order to print directly from your applications. Download the appropriate driver for your computer's operating system. Egan Library staff can provide hands on assistance at the kiosk, just ask. Users encountering any printing problems, e.g. jams, misprints, formatting issues can notify Ink support through email at support@inkcloud.me or by phone at 1-800-INK-6053. Refer to the Alaska3 kiosk to receive a corresponding credit. Several scanning options are available. There is a public access scanner/copier (Konica-Minolta) near the Circulation Desk. The Egan Library Ink kiosk also offers free document scanning. The Konica-Minolta supports duplex scanning, has a feeder for multiple page jobs and outputs PDF or TIFF formats to email. 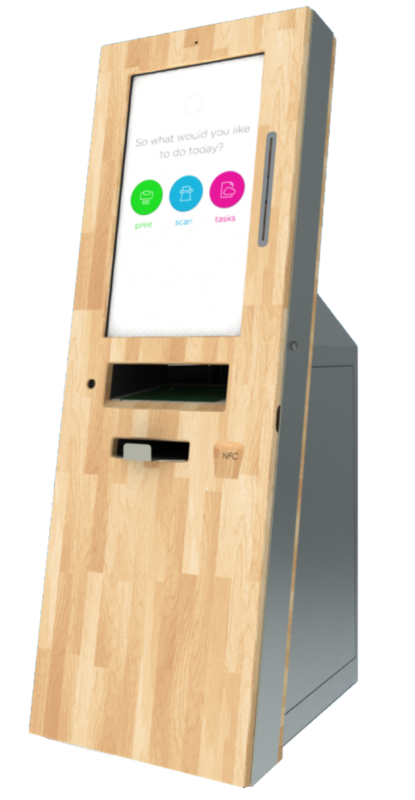 The Ink kiosk supports scanning to cloud storage accounts, USB, email and in a variety of formats. No manual feed option is available for multipage scanning jobs. A self-service black & white copier is located on the main level by the Circulation Desk ($.10 per page). The copier accepts bills ($1, $5, $10) and coins. Prepaid copy cards are available for sale at the Circulation Desk (in $5, $10, $20 denominations). Black & white and color copies can be made on the Ink kiosk but no manual feed option is available for multipage jobs ($.10 per page for BW copies, $.40 for color). We recommend using the black & white copier for multipage copying. The Ink kiosk supports faxing of documents scanned at the kiosk or stored in cloud storage accounts. No manual feed option is available for multipage jobs. No fax confirmation receipt is available. Users can also fax documents directly from the UAS Ink Cloud Portal. Pricing is listed above. Sitka and Ketchikan campuses each use a different print server. This does not change Mac printing, but does change what to search for on a PC.